TITUSVILLE - Sen. BarackObama promised not to cut NASA funding and said Saturday at a town hall meetinghe will rely on Florida Sen. Bill Nelson and revered astronaut and former Sen.John Glenn to help form his space policy. "Under my watch, NASAwill inspire the world once again and is going to help grow the economy righthere in Brevard County," said the presumptiveDemocratic nominee, speaking to a crowd of 1,400 at Brevard CommunityCollege's Titusville campus. Obama has changed anearlier position, in which he planned to delay theConstellation program five years and use up to $5 billion from the NASAbudget for education. "Here's what I'mcommitting to: Continue Constellation. 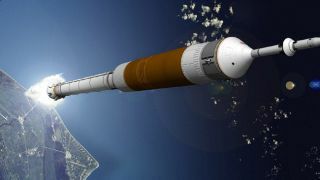 We're going to close the gap (betweenthe end of shuttle flight and the next program, Constellation). We may haveadditional shuttle flights," he said. "My commitment is toseamless transition, where we're utilizing the space station in an intelligentway, and we're preparing for the next generation of space travel." In an interview with FLORIDATODAY after the speech, Obama would not detail whether he plans to changePresident Bush's visionof returning to the moon and going to Mars. Obama also would not pledge tosign a $2 billion increaseto NASA's $17 billion budget. The proposal might save some of the 3,400jobs that are expected to be lost at Kennedy Space Center. "I don't want to giveclear figures yet. I want to have a thorough evaluation of a combination ofmanned and unmanned missions, what kind of exploration would be the mostappropriate, and I want the budget to follow the plan. I'd want to see the proposalfirst," he said. With appearances Friday andSaturday in Central Florida, Republican candidate Sen. John McCain and Obamaare battling head to head for votes in the crucial Interstate 4 technologycorridor of Florida. McCain spoke at the Urban League convention Friday inOrlando, and Obama also was scheduled to speak Saturday to the organization. In Titusville, Obamaentered the town hall meeting with Nelson as the audience pounded on thebleachers and cheered. "Yes, we can! "the crowd chanted. "I've been workingBarack, telling him it's the I-4 corridor of Florida that will make adifference," Nelson said. The presidential candidatebegan by pointing out that gas and food prices are soaring, job losses continueand the average American's income has decreased by $1,000 in the past eightyears. "Are you better off now than you were four years ago or eight yearsago?" he asked the crowd. Obama outlined a short-termrelief plan that includes a $1,000 tax reduction for 95 percent of Americans,an additional mortgage interest deduction, no income taxes for seniors who earn$50,000 or less and equal pay for equal work for women. He also plans a $50billion stimulus proposal: Half would go to local governments, and half wouldgo to build roads and bridges. These programs would bepaid for by taxes on windfall profits of oil companies and by repealing theBush tax cuts for the wealthy and for corporations. "All those things arejust in the short term. We've got to bring back our long-term prosperity,"he said. "I have often said that this election is a defining moment in ourhistory.? Publishedunder license from FLORIDA TODAY. Copyright ? 2001 FLORIDA TODAY. No portion ofthis material may be reproduced in any way without the written consent of FLORIDA TODAY.